SAN DIEGO (CNS) - Parole was granted Wednesday for the man who killed a 20-year-old college student and pizza deliveryman in 1995 when he was a 14-year-old gang member. Tony Hicks, now 37, was the first youth in California to be tried as an adult under a law adopted in 1995 that allowed juveniles as young as 14 to be tried as adults for murder. He pleaded guilty to first-degree murder in the death of Tariq Khamisa and was sentenced to 25 years to life in prison. He has served 23 years behind bars. 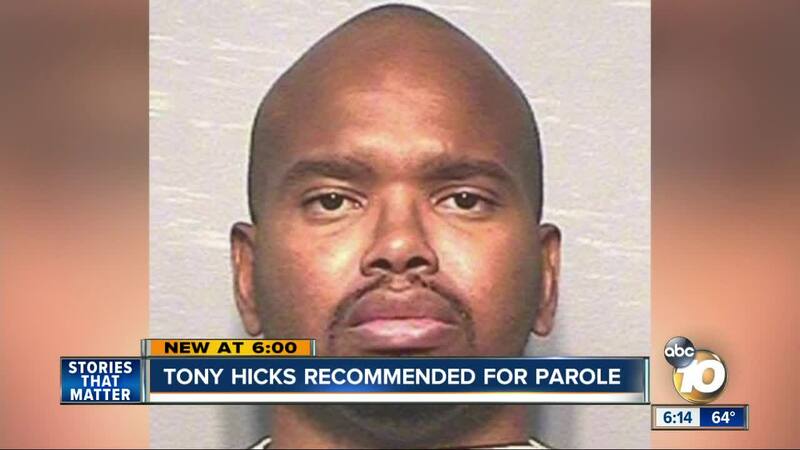 Wednesday's decision, made by the state parole board, now goes to the governor's office for possible approval. Gov. Jerry Brown recently signed Senate Bill 1391, which eliminates the ability to try a defendant under the age of 16 as an adult for any violent crime. Those convicted under the new law will be held in locked juvenile facilities instead of adult prisons. "If this law (SB 1391) had been in effect in 1995, Tony (Hicks) would have been prosecuted in Juvenile Court and paroled many years ago,'' said Azim Khamisa, the victim's father. ``The other two individuals involved in the crime were sentenced in Juvenile Court. Tony made a mistake. He has atoned for it in many ways. He has paid his debt to society. It is time for him to be it in many ways. He has paid his debt to society. It is time for him to be released." Tasreen Khamisa also supports the release of her brother's killer. She said that when he was 16, an immature Hicks was incarcerated with some of the most hardened adult offenders in the state at Folsom Prison. According to spokeswoman Tanya Sierra, the San Diego County District Attorney's Office has not written a letter opposing Hicks' parole, nor has it submitted a letter in favor of his release. District Attorney Summer Stephan has the option of taking a position at the hearing, which she is scheduled to attend, along with Deputy District Attorney Richard Sachs, Sierra said. In the wake of his son's murder, Azim Khamisa reached out to Hicks' grandfather in the spirit of forgiveness and founded the Tariq Khamisa Foundation, which ``is dedicated to teaching and inspiring forgiveness, hope and peace in youth and setting them on a path towards opportunity,'' according to the San Diego nonprofit's mission statement. In preparation for his second chance at freedom, Hicks has earned his GED and college credits toward an associate's degree, according to the foundation. He has also been writing a blog for the TKF website, answering students' questions. The Khamisas traveled to a San Luis Obispo prison to attend the state parole board hearing.